Not much equals the pleasant feeling of a weekend on one’s doorstep. Kicking off the shoes after a day at work, breathing in and being able to set aside the office keys, even if only for one or two precious days. Hopefully they will be your own and filled with things you enjoy most. A walk through the woods. Indulging in some sports. A short trip. Cooking. Doing that thing you always wanted to do but never did. Catching up with friends and talking to them all day long. Laughing or crying together. Spending time with the loved one(s). Or simply enjoying a wonderful book and a glass of wine. Or read that amazing fan fiction with more than 100,000 words in one go. For me film nights on a Friday evening are always a thing to look forward to. Relaxing on the couch, alone or in company, munching delicious stuff whilst ogling the screen with delight. Maybe that Danish road trip film that we can never have enough of. Maybe something dark. Maybe something heartwarming. Maybe a classic. Maybe even a series. Or maybe the favourite chick flick that never fails to make me warm and fuzzy inside, no matter how often I’ve watched it already. Whichever you prefer, I can recommend this popcorn. I know, it’s utterly sinful. But hey, it’s Friday! Preheat the oven to 200 °C. Lay the chicken skin pieces flat onto a baking tray covered with baking paper and sprinkle with a bit of sea salt and freshly ground pepper. Roast for about 20 minutes, until they look golden, bubbly, and crispy. Place them on kitchen paper to cool down. Melt 50 g of the butter on medium heat, add the herbs, and keep on cooking for a minute until it smells nicely. Remove from the stove. Put the remaining butter into a large pot. Melt it on medium heat and add the corn. Close the lid and wait for the corn starting to pop. Keep the lid on and shake the pot from time to time, so nothing gets burned. When the popping noise stops remove the pot from the stove. 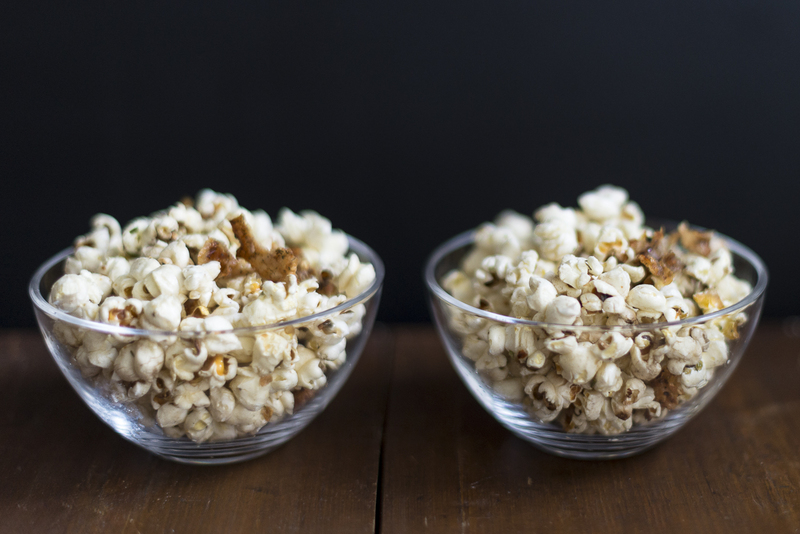 Drizzle the melted herb butter over the freshly made popcorn and add sea salt (perfect are salt flakes) until you like the taste. Crumble the chicken skin into bite sized pieces and sprinkle them over the popcorn.